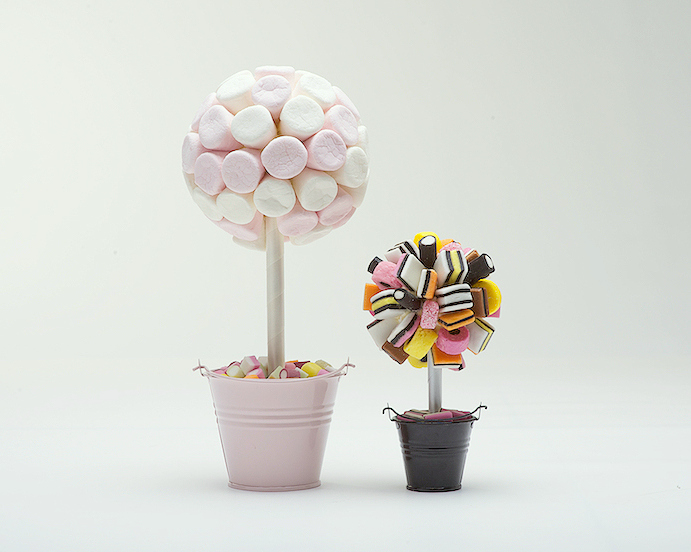 Have great fun making these sweet tree centrepieces or gifts for birthdays, parties, barbecues, weddings. 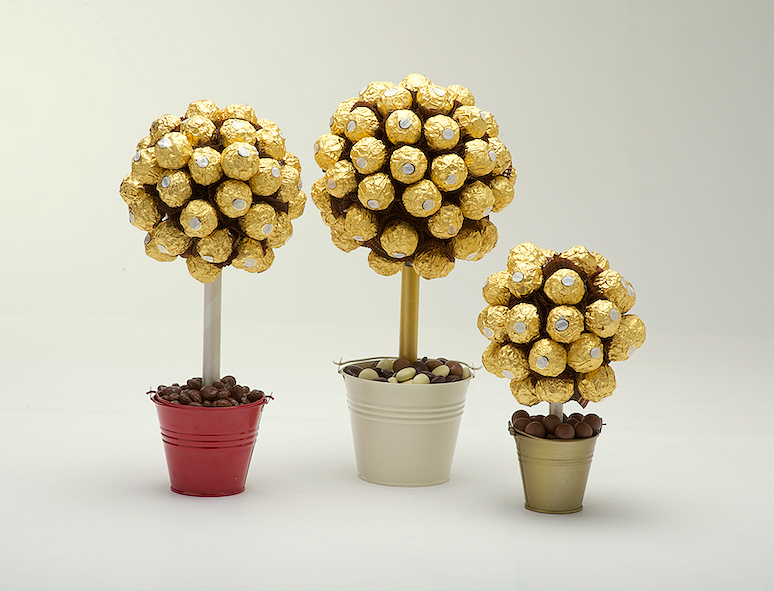 For mini sweet trees like the Liquorice Allsorts or smallest Ferrero Rocher sweet tree use a ball measuring 60mm or 70mm, with our mini 2.8" or tiny 2" bucket and a 9mm or 12mm dowel, 20cm long. If you want a very large sweet tree, or a floor standing tree, go for a ball which is 130mm or larger and a 60cm long dowel (18mm or 21mm thick) and a 5" or 6" bucket. Of course you can use any polystyrene / styrofoam shape for this project - cones work really well - we have a massive selection! If you want to try something like a cone - aim for the polystyrene item to be the same width as the top of the bucket that you choose. 1) Put some strong PVA glue, like our SUPERTACK adhesive onto the end of your dowel / stick and push it into your polystyrene shape. You may want to make a hole in the polystyrene ball first using a skewer or a drill. 2) Take your pot/bucket. Stand the dowel (with the ball on top) in the centre of the bucket/pot. Pour the mixed casting plaster into the bucket. It should fill the bucket to about 1/3 full. Hold the dowel in place until the plaster sets (once fully dried, you can then cover the plaster with something pretty like gravel etc or wrapped sweets and wind ribbons around the dowel to decorate). Remember clay or pebbles are not strong enough to hold a sweet tree - plaster is the only suitable material for the job. 3) Cover the balls with cling film or attractive tissue / decoupage paper of your choice. Ideally leave your sweet tree to dry for at least 24 hrs or longer if you can so the plaster etc is fully dried out. 4) Attach the sweets using cocktail sticks or if the sweets are wrapped, you can use a hot melt glue gun to stick them straight onto the covered ball. You can also use our polystyrene cones and rings in a similar way. For Cupcake bouquets we recommend a 17cm (170mm) ball pushed into a 6" bucket as your starting point and attach the cupcakes, in their cases, in a similar way, to the covered ball. Please note sweet trees are recommended for children (and adults!) over 3 years of age.